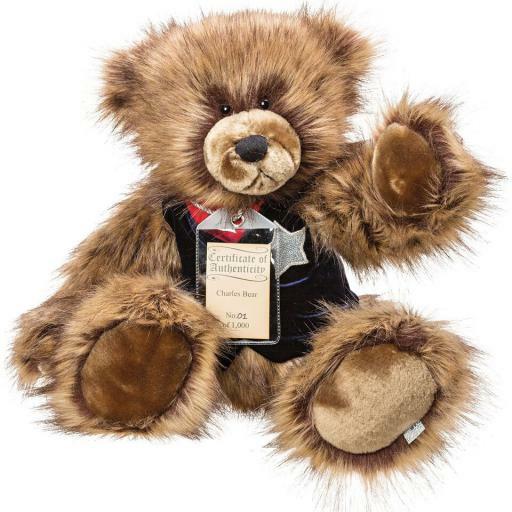 For the ultimate in smart collectible bears, you can't go far wrong with Charles. Charles comes in plum coloured plush, graduating to light brown at the tips. He has a black embroidered nose and his pads are light fawn, in soft boa fabric. Charles is dressed up! He's wearing a cardinal red neckerchief, tucked into a buttoned up midnight blue velvet waistcoat with a stitched on silver star badge. As with all the Silver Tag bears, Charles is fully jointed, substantially weighted, and has a classic hump. Charles comes with an individually numbered Certificate of Authenticity. He is 46 cm standing. Charles is one of 1000. He can be spot cleaned.